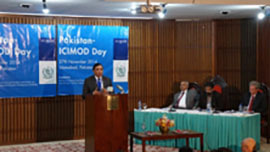 Pakistan-ICIMOD Day was celebrated on 27 November 2014 at the National Agricultural Research Centre (NARC), Islamabad, under the auspices of the Ministry of National Food Security and Research (MNFS&R), Government of Pakistan. The event provided a platform for mutual learning, mountain knowledge sharing, and networking among the national partners for smooth implementation of ICIMOD’s programme in Pakistan. Around 300 national and international participants were part of the celebrations. The event featured various activities, including a daylong conference, partner’s exhibition and an evening session on youth. Sikandar Hayat Bosan, Honorable Federal Minister for the MNFS&R and chair of the ICIMOD Board, opened the event by launching two new ICIMOD publications. Presentations were made by Seerat Asghar, Secretary of the MNFS&R and ICIMOD Board Chair, Dr David Molden, ICIMOD’s Director General, Dr Iftikhar Ahmad, Chairman of PARC, Dr Eklabya Sharma, Director for Programme Operations at ICIMOD, and Basanta Shrestha, Director for Strategic Cooperation at ICIMOD. Participants included parliamentarians, media persons, ICIMOD partners, representatives of government and international organizations, scientists, and youth representatives. During the technical sessions, experts from partner organizations, i.e., Government of Khyber Pakhtunkhwa (KPK), PARC, Pakistan Meteorological Department (PMD), Water And Power Development Authority (WAPDA), National University of Science & Technology (NUST), and COMSATS, presented the work they are doing in Pakistan in partnership with ICIMOD. The follow-up discussions mainly focused on enhancing and strengthening the partnerships between ICIMOD and its partners in Pakistan. National and international partners displayed their work in an exhibition geared towards raising the awareness of participants and visitors. At the end of the event, participants of the ICIMOD Youth Forum were given certificates.